We are Yolkboy and Lady Gwynhyfvar and we host podcasts about George RR Martin’s ‘A Song of Ice and Fire’ novels. We feature literary analysis of the entire series, following character arcs or themes, and include theories alongside readings, pseudo adverts from Westeros, and guests from the fandom. 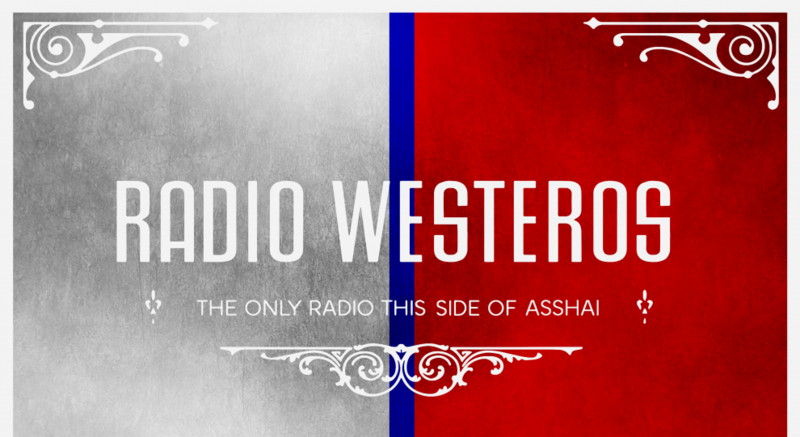 Radio Westeros is the only radio station this side of Asshai and we have SPOILERS all books! Use the buttons in the sidebar to SUBSCRIBE to us on iTunes or Google Play or add the RSS to the podcatcher of your choice, SUPPORT us via Patreon, PayPal, or Ko-fi. FOLLOW us on Twitter, give us a LIKE on Facebook and don’t forget to COMMENT on our content. New to the podcast? Check out the EPISODES page or choose your favorite theme or character from the tags in the sidebar. Don’t forget to check in for periodic bits of NEWS and SHARE what you like about us with your friends. Finally, you can now support us by SHOPPING at Amazon! Simply click here to browse the site and make purchases that benefit us at no added cost to you. Use the links in the sidebar to go directly to Fire & Blood and other titles from GRRM. Or if you prefer audio books, there’s a special offer from Audible as well!